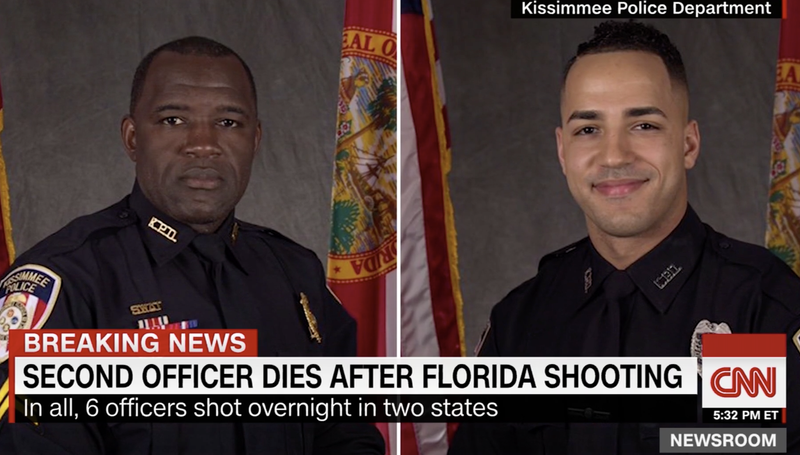 Two police officers in Kissimmee, Fla., a suburb of Orlando, have died after a shootout Friday night. Police have identified the victims as Sgt. Richard “Sam” Howard, who was pronounced dead at a hospital Saturday afternoon, and Officer Matthew Baxter, who died at the scene. Everett Glenn Miller, 45, has been charged with first-degree murder in Baxter’s death, and two others are in custody but have not been charged. Florida Gov. Rick Scott tweeted his condolences to Baxter’s and Howard’s families on Saturday. According to CNN, the governor used his executive privilege to move the Baxter case from a prosecutor who has refused to consider the death penalty. Scott has already reassigned 24 prior cases from State Attorney Aramis Ayala—who has gone on record saying that the death penalty is overly expensive, slow and inhumane and does not increase public safety—and Ayala has sued the governor for his actions. The new prosecutor on the case will be State Attorney Brad King. In addition to first-degree murder, Miller faces charges of carrying a concealed weapon and resisting arrest.